After a major design overhaul, Google has recently announced the new security features for all G Suite account users. This will help in forbidding the phishing attack, especially through emails to some extent. Get new Google account verification features to prevent from phishing attack. The main aim of Google is to deliver the best level of security to every Google services user. Now, to achieve this, a new verification feature is introduced by the Google. It will verify the Google account that a user is signing in is controlled by him/ her or not. It is basically a two-step authentication feature to prevent any sign into Google account, which is owned by some malicious third-party This means it will protect users from singing into an account created by hackers. This feature will display a verification screen (accounts.google.com) as a G Suite user sign in with Security Assertion Markup Language (SAML) from a third-party website. This feature will confirm the identity of the user and then continue the sign in process. It is basically done to Google account from potential attackers. Now, to know how to get new Google account verification feature for to prevent from phishing attack continue reading an article. How New Google Account Verification Feature Works? 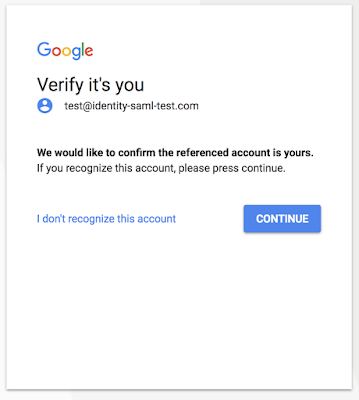 The new Google account verification feature screen simply work as an extra layer of security whenever there is a third-party login via SAML single sign-on protocol (SSO). It is because this protocol does not require user’s involvement and used by attackers to make users sign in to their account. In this case, this verification page will pop-up and ask users to confirm if this account is controlled by them or not. Now, it depends upon the user, he or she can either confirm that account belongs to them or can check the “I do not recognize this account” option to disagree. After this, a user needs to check who wants him or her to enter a malicious website. These new verification features are still made optional by the Google. It means if a user wants, then he or she can disable this feature also. In order to turn off this feature in their organization, G Suite admins can use X-GoogApps-AllowedDomains HTTP header. It will determine some domains also, whose users can access the Google Service. As a user disable this service, the users of those domains will not see the verification screen. It is because the Google will consider all these domains trusted by the users. One is to prevent users from any type of phishing attack. It is because a various type of email attacks are taking place these days. Thus, to keep users safe from such attacks, this new step is initiated by Google. Another major motive behind this is Google wants to create a consistent identity for the users. After that, a user can use this consistent identity across the Google web and native services of the Chrome browser. It will require extra security during authentication, which is offered by new verification feature by Google only. This new Google account verification feature will affect the daily activities of the users. It might also be possible that users feel irritated due to this new verification screen but for Google security of users, online account is more important. Initially, this verification screen will be shown once per user per device. This screen is not displayed to the users who use G Suite or cloud credentials only for their identity.